Neil spoke to the Even The Stars website, to provide a track-by-track run through of Tales of Coincidence, the debut album by Carousel Clouds. We selected this as the opening track because the title seemed quite appropriate, but also because this was in many ways the start of how Carousel Clouds sounds, with the drone-y keys and feedback, and lots of vocal harmonies. When this song was written, it laid a path for the direction to take the band and sound – moving from an acoustic sound and a smaller number of people being involved, to adding keys, drums, guitars, harmonies, and more people to hop on and off the carousel! The shoegaze-y build-up in the intro gives a good indication as to what’s to come on the record. A ghost story. I went on one of those ghost tours. It was entertaining, but also quite interesting to watch unfold. The song explores the thoughts and ideas of ghosts; people’s fondness or fear of them. The drone-y sounds mentioned when Starts & Ends was written seemed to lend itself to this song both musically and lyrically, with feedback always to me sounding quite spooky, and pounding toms like an incessant warning. Three of the five of us who recorded the album are bass players (Tam with LIINES, Dickon with Bone-Box and loads of different acts, myself with Optional Wallace and Monroe Hips), but there is not a single note of bass on the whole record. When I demoed this track, I couldn’t settle on a bass line, so just put a low-octave organ on and held down the root note, to fill out the low-end. It sounded loads better, and so set the blueprint for the ‘bass-players-but-no-bass’ approach to the record. This song had been around before this band, and was I think the first we tried working on. The song adapted quite quickly to the band’s sound of feedback, psych-keys and some drone, with lots of harmonies. For the recording, Tam and Ben added a do-wop style vocal harmony they’d worked on, whilst Matt was giving it everything on the drums at the outro, which we think works really well. There’s all kinds of other sounds at this stage, we can’t remember exactly what, but Dickon layered everything together brilliantly to bring some cohesion to the chaos. The last track written for the album, which was written and demoed in a couple of days. A large proportion of the original demo is what you can hear on the final record, which kept the freshness and rawness intact; it was written at a particular time and therefore hopefully captures that moment. A suitable antidote to follow ‘Screen’, and a good point to close part one of the album. A song in four parts. The Torment came from two things I had been working on, and then placed together. The coda was a completely separate piece Ben had started, which I thought would fit well as well. We then spent hours in the practice room making it into a coherent song. The five of us were never all together at any point during the making of the album, and Dickon hadn’t heard any of this track until he recorded his guitar parts over the top of the rest of the song – he sent it back with his parts on, and we all thought, ‘wow’. Way before Carousel Clouds existed, Ben asked me to add a vocal line to a piece he had written. He had the title, but no lyrics or melody, and emailed me the track. It sounded great as an instrumental, an ambient electronica. I re-demoed it for the record, to fit more with the band’s sound and instrumentation. Then we worked on the dynamics and the time signatures, so it’s taken on a new life. We will have to release the original version at some stage, to hear where it came from. It still sounds great. Another old song, which had started as an acoustic track, but then seemed to fit with the Carousel Clouds sound, once that had emerged. Probably the most personal song for me to write, lyrically. It’s another song with ghost references, and Tam’s harmony on the chorus really gives that haunting feel. We released this as a single, and the video involved me at various festivals, gigs, parties and even a wedding with tape and assorted items covering my mouth, ie not talking. Luckily the bride and groom were very understanding! We’re proud of the whole record, but from a songwriting perspective I am personally pleased that, on Grace, we tried to match the lyrics to the music in a way I haven’t done before, to the extent that an actual heartbeat is used for they rhythm at one stage. Hopefully, the subject matter dovetails perfectly with the sounds we are making, changing moods accordingly, including repetition, monotony, hope and euphoria. We think it does, anyway! Similar to The Torment, it is almost like two songs bolted together, with multiple time signatures and no traditional chorus – obviously, this is the next single…! I wrote this the day after the General Election; The lyrics came together quite quickly. Sonically, and lyrically, it is supposed to represent extremes: light and shade, loud and quiet, ending with the crescendo coda. When Tam added her vocal for the outro, there was no set part. We discussed the lyrics and turned the lights off to set the tone, then left her to it. When she finished, Dickon and I turned to each other in stunned silence. In a good way! Not sure where her part came from but it was raw, organic and completely off the cuff – and the perfect climax for the song, and record. You can hear bits of Starts & Ends woven in, before the album finishes, which we think neatly brings things around and closes the record off. The album is available to order via Bandcamp. 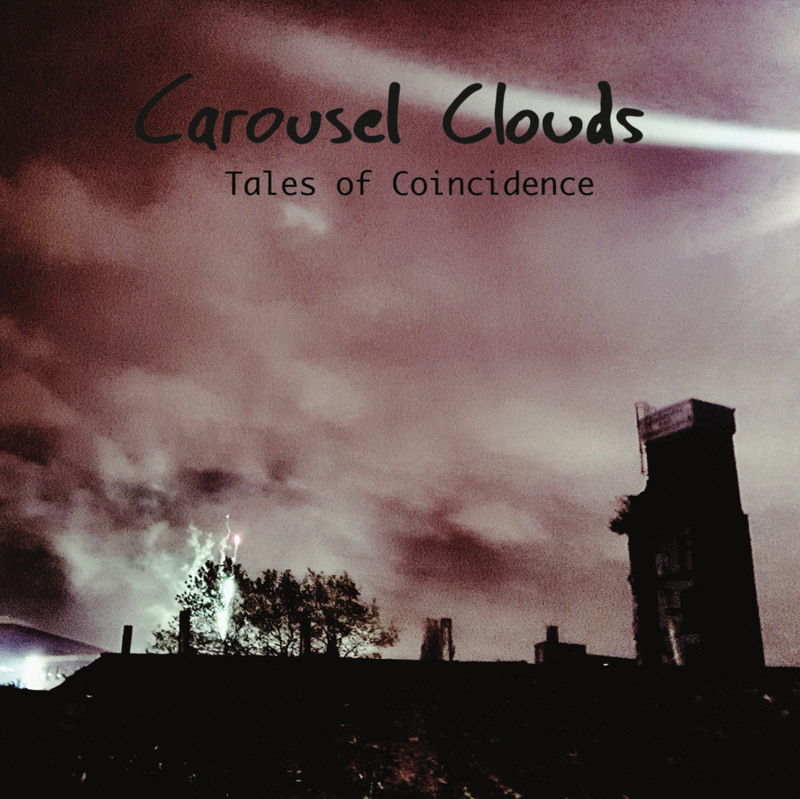 The debut Carousel Clouds album ‘Tales of Coincidence’ was released on 6th April 2018, on Ranch Records. The ten-track record is available as CD or download. You can order now at the Carousel Clouds Shop. 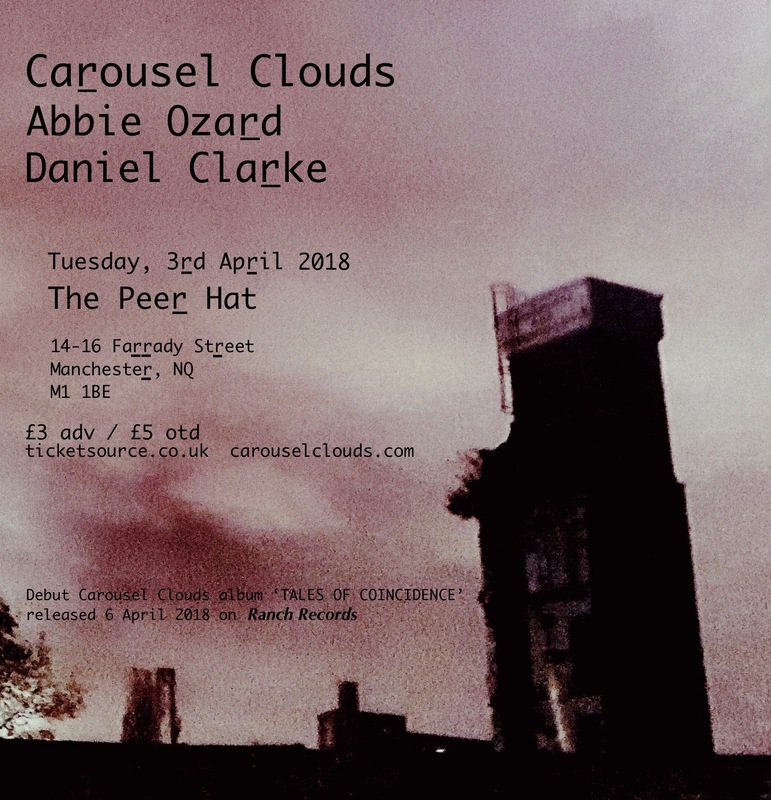 After three years spent largely in a self-inflicted darkness perfecting the album, Carousel Clouds are now ready to step into the limelight. Recorded with Ding (The Fall, Pixies, Cabbage), and for the most part at their Salford base, The Ranch, the record boasts ten tracks of ‘Ghost-Gaze’ – shoegaze-meets-prog songs, all sprinkled with pop melodies. Shadowy themes continue lyrically, encompassing ominous Tales of the supernatural, of spirituality, loss, and of the afterlife. Tales of Coincidence is released on 6th April 2018, on Ranch Records. Recorded during 2016 and 2017 at The Ranch, Salford, UK. Except drums – recorded June 2016 by Ding at 6DB, Salford, UK. Engineered, mixed and mastered by Dickon Kyme-Wright at The Ranch. Produced by Dickon Kyme-Wright and Neil Meehan. The Peer Hat, Manchester. 8pm. Tickets are just £3 advance. For £10, you can reserve your ticket and order a CD copy of Tales of Coincidence, which you can collect at the venue on the night – ahead of its official release. The debut Carousel Clouds album Tales of Coincidence will be released in April 2018, on Ranch Records. Full details of the release will be available soon. Enter your email address to receive notifications of new Carousel Clouds posts by email. Had a great time reviewing 3 ace tracks by @foxgloveband @__mealtime and @swalesmusic on the @introducingmcr show last night with @kimmy_whp . Thanks @natalieevemcr for having me! Listen back on #bbcsounds app.